Alev Berberoglu: Your artistic practice has a multidisciplinary character ranging from drawings to slide projection installations that respond to a particular architecture. Where does book making stand considering the entirety of your works? When did it begin and how did it develop? Rebecca Travis: My book making practice originally developed as a means of archiving the collage slides I was producing and processes I was using through my drawings. The first two books I made,Defunct and Exposure documented a series of slides I had produced using a variety of translucent materials. Slides themselves are synonymous with the notion of archiving, organizing and documenting, so I felt that a physical collection of them in the form of a book was appropriate. As this pair of books was successful, I then created three more books documenting embossing (emboss destroy (i) and (ii)) and pinprick drawing (Puncture.Build). Together these five works were exhibited in White Wilderness prior to my final degree exhibition. Seeing people openly interacting with them as objects and taking time to carefully observe each page made me realise the power books have to engage viewers and they have since become an integral mode of visual presentation within my practice. In my recent solo show Controlled Ruin books and projections were presented alongside each other for the first time. I found that the inherent differences in each of the mediums complimented the overall viewing experience; whilst the large-scale projections offered a collective and physically intangible viewing experience, the books provided an intimate and wholly interactive, material one. A.B. : You are also an art critic writing in CANNED magazine and in the culture blog The Flaneur. How does your writing art critiques influence your art production and the way you approach your works theoretically? Does it provide you a special kind of awareness? R.T.: I find it makes me more aware of the reasons why I try a certain technique or how I can contextualize what I create both within my own body of work and in the wider art world. Moreover it gives me an awareness of the interpretation of my own works to viewers. There is nothing more cathartic than putting a thought, argument or idea into written words and this applies as much to me explaining my own work as to my critique of others. A.B. : Have you been to Istanbul before? What are your impressions of the city? R.T.: I spent five months in Istanbul during an Erasmus exchange programme in 2010 studying at Marmara University on the Asian side of the city. The attraction with the residency at Gallery/Miz was to have the opportunity to make a welcome return to the city but be based on the European side. I think Istanbul is a fascinating place with so many layers of culture, history and aesthetic tradition, in particular with it being spread across two continents. As an artist there’s a rich mass of inspiration to draw from and I noticed that in the two years since I was here last there has been a boom in arts venues, especially in the Beyoğlu area. A.B. : Could you describe the works you produced during your residency period formally and conceptually? 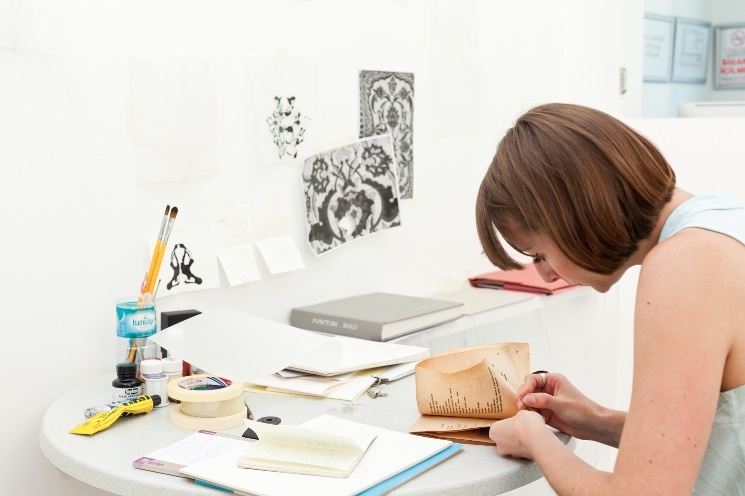 R.T.: The works that I produced during the residency are a response to the book binding craft traditionally practiced in Istanbul and a continuation of my own book making practice. The first, Controlled Ruin (ii), takes the form of a softbound book and continues a theme of destructive mark making explored in a project of the same name earlier this year. Each page uses a decorative motif taken from an Iznik tile pattern that is depicted using seemingly destructive techniques such as puncturing, ripping and scratching. The marks, though physically damaging to the paper, often have a delicacy and beauty, and the pages come to emphasize the ironic allure apparent in states of decay. This combination of decorative aesthetics and ruination can be applied to the architecture of Istanbul, a city in various states of rebuild, ruin and demolition. In addition to this, each page has two distinct sides so that the positive and negative effects of the mark making can be seen on the same surface; these two sides come to represent the divided nature of Istanbul across two continents. Hand binding in golden thread continues the aesthetically decorative approach and simultaneously hints at the importance of book binding in Istanbul’s craft traditions. 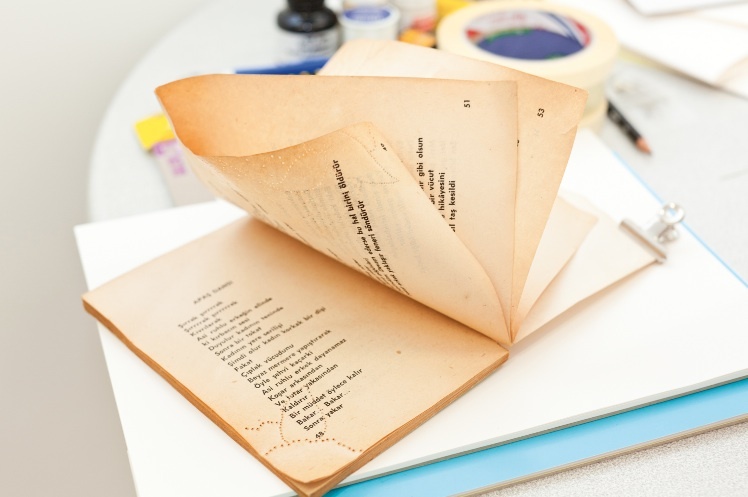 The second piece, Perdem, is a found book, which is turned into a decorative, sculptural object through a process of varnishing and pinprick drawing. It also forms one half of a book ‘exchange’ in which a Turkish book ‘Perdem’ found in Newcastle was returned to Istanbul and an English book ‘Savoy Grill at One!’ found in Istanbul was returned to Newcastle. A.B. : This book “exchange” project is particulary interesting. As, in a way, the books come to represent you, or become a metaphor for your own presence and also your cross-cultural traveling. Moreover, while “Perdem” loses its primary function and becomes unreadable, it gains a sculptural quality. “Perdem” acquired Iznik tile patterns, how will “Savoy Grill at One!” change? R.T.: ‘Savoy Grill at One!’is an English book found at a second hand shop during my stay in Turkey that has returned home to Newcastle with me. It too will be re-worked into a sculptural object using varnish to strengthen the pages and help it maintain its new form. I have begun working into it with pinpricks that depict a traditional wallpaper design by William Morris, perhaps the most recognizable, and typically English of surface designers. Although Morris was working significantly later than the original Iznik tile designers there are many similarities between the two, namely their focus on natural flora and fauna within the designs and their symmetrical compositions. This perhaps demonstrates that despite the cultural and geographical divide; aesthetic traditions remain rooted in certain themes such as the natural world. A.B. : Let’s focus on the technique you employed while making “Perdem”. By the end of the 18thcentury it was a favourite leisure activity to work in paper using various techniques for creating images and decorative effects, and late in the century pin pricked pictures began to appear. Most pinprick pictures were made in England or Germany, and during the Victorian period making pinprick pictures was a popular children’s activity. How do you relate this technique to your current practice? R.T.: I suppose it is most relatable in its playful use of light to create visual effect. I began pinprick drawing some years ago after becoming increasingly frustrated at being unable to capture the effect of light through more traditional drawing and painting techniques. It made sense to me to use actual light instead, so I began puncturing my drawings and prints to allow light through. I particularly enjoy the physicality both of the mark and of the action that goes towards making it and its contradictory nature that such a permanent and ‘defacing’ action can create an aesthetically decorative effect. A.B. : One of the new works you created at Galeri/Miz (Controlled Ruin (ii)) directly relates to another project. Could you tell us briefly about Controlled Ruin, which was an exhibition in conjunction with the Armstrong Studio Trust at Jesmond Dene Banqueting Hall? R.T.: Controlled Ruin was a site-specific project in a Grade II listed building in Newcastle. The project title came from the categorization of the building itself by English Heritage. I found it a fascinating phrase, as it is somewhat of an oxymoron; the want to control is a very human characteristic, whereas ruination is essentially a natural process. For the exhibition I produced three site-specific text projection works using descriptive phrases written about the building’s original appearance in an effort to connect its present and past states. In addition to this I presented three books, two previous works and one made specifically for the project. I found I could apply the phrase ‘controlled ruin’ to processes already used in my book making (repeatedly pin pricking and embossing) and furthered this by creating a new book also called Controlled Ruin that recorded a variety of destructive mark-making techniques such as ripping, puncturing and spilling. The interesting outcome was that the surfaces created on the page by using these techniques came to echo those of the ruined building itself. Despite this project being site-specific I found the whole notion of ‘controlled ruin’ such a rich area of inspiration that I wanted to further it during my stay in Istanbul and apply it to the architectures I found there. A.B. : In what ways do you think this residency contributed to your art? 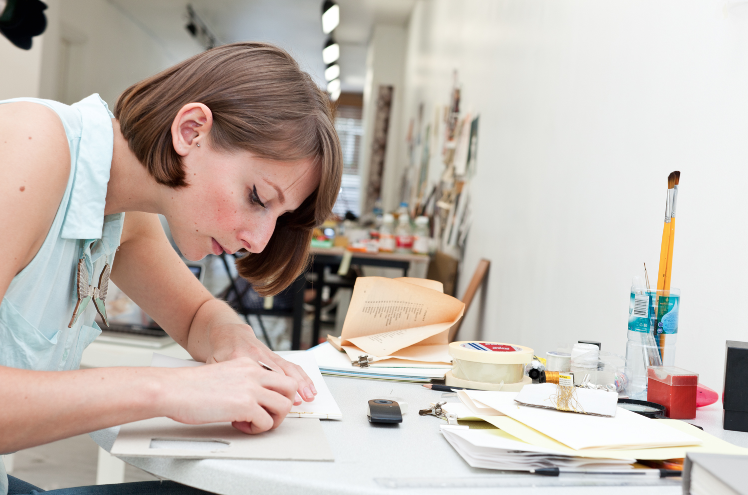 R.T.: I found the residency gave me both rich inspiration and context in which to create new works. The opportunity to return to Istanbul allowed me not only to revisit certain places, but also to experience different areas and in particular to see how the city’s art scene had flourished in the two years since I left. I found the chance to engage and exchange ideas with other artists in the gallery space particularly valuable, as for the last year I have worked relatively independently on solo projects. Through the pieces I produced I was able to both continue themes that I have worked with previously and to realise entirely new works, specific to my time in Istanbul. This entry was posted in Galeri/Miz. Bookmark the permalink.